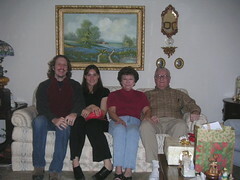 Me, the child bride, Libba (my grandmother) and Breezy (my grandfather) all squished onto my grandparents' couch. While the cheesy idyllic painting of West Texas is inescapable, a less obvious element of this picture is that it features no less than six music boxes. My grandfather seems hell-bent on taking just about every piece of crap he finds at garage sales and turning it into a music box. He does this by taking a figurine*, gluing it to a wooden base, and then inserting the player from some abandoned or broken music box, also purchased at a garage sale. I estimate that he makes an average of one music box every two days. My grandparents' once-seemingly-large home is cramped with hundreds of these homemade tat music boxes. My grandmother does her best to keep the stock rolling out the door, but it is simply impossible for demand to keep up with supply. "Your grandfather has always been about quantity than quality," my grandmother said. What makes Breezy's hobby even more absurd, however, is that he is completely tone deaf. The man can recognize only one tune -- "You Are My Sunshine." He has to ask my grandmother which songs are being played and then does his best to match up the title with whatever figurine/snow-globe/award/doll/box he plans to turn into a music box. *My favorite Google image search return for "figurine." Why are you so much happier than everyone else in the picture? cute family, just saw the slide show- that kid on the dj material rocks!